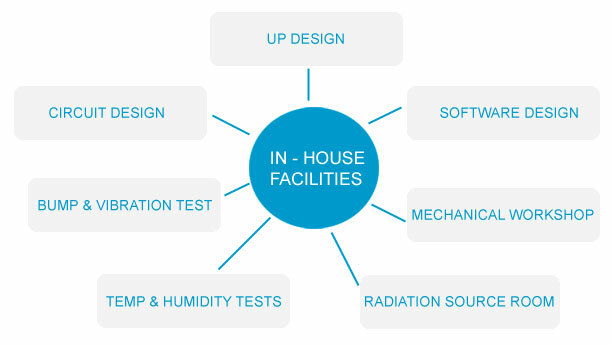 Today PLA has all the infrastructure under one roof required for development, manufacturing/supplying, technical support, installing & servicing of radiation monitors. This includes in-house radiation calibration lab having various radioactive isotopes of different energies, activities and sizes, certified radiation safety officers, experienced engineers, latest electronic equipment, mechanical workshop, environmental test setup and software development facility. PLA has entered into Radiation Monitoring Instruments since 1973 by developing Health Physics Instrumentation. With it's strong R&D and manufacturing background, PLA has kept on expanding it's product line since then. Instruments such as Survey Meter, Area Monitor, Hand Monitor and whole body monitors were introduced. In 1986,PLA joined hands with Defence Lab Jodhpur, DRDO for the development of radiation detection equipments like Roentgenometer & Flash Sensor. Subsequently, Portable Doserate Meter & Pocket Dosimeter were developed. In the year 1987, PLA entered into development of control panel for underground NBC field shelters. In 1997, PLA entered into development of control system for NBC protection of battle tank and since then produced hundreds of systems for Heavy Vehicles Factory, Avadi. PLA has started supplying various types of survey & contamination meters to paramilitary forces since 2003 for Nuclear emergency preparedness. PLA is always on lookout for any new designs, ideas, technology transfers, contract manufacturing proposals and dedicated to supply the most reliable quality instruments with state of the art designs. PLA has rich experience in development, manufacturing & supply of electronics products in diversified fields like Test & Measuring Instruments, Components (Relays, Timers), Telecommunication, Medical Electronics, Opto-Electronics & of-course Radiation Monitoring Equipments. PLA also has easy access to various resources like research centres, scientists, consultants, test laboratories etc. For customised solutions, specific to your needs, please feel free to send in your detailed requirements/specifications.